1. Good for stomach - Lemon can help relieve many digestion problems when mixed with hot water. These include nausea, heartburn and parasites. Due to the digestive qualities of lemon juice, symptoms of indigestion such as heartburn, bloating and belching are relieved. By drinking lemon juice regularly, the bowels are aided in eliminating waste more efficiently. Lemon acts as a blood purifier and as a cleansing agent. The intake of lemon juice can cure constipation. It is even known to help relieve hiccups when consumed as a juice. Lemon juice acts as a liver tonic and helps you digest your food by helping your liver produce more bile. It decreases the amount of phlegm produced by your body. It is also thought to help dissolve gallstones. 2. Excellent for Skin Care - Lemon, being a natural antiseptic medicine, can participate to cure problems related to skin. Lemon is a vitamin C rich citrus fruit that enhances your beauty, by rejuvenating skin from within and thus bringing a glow on your face. 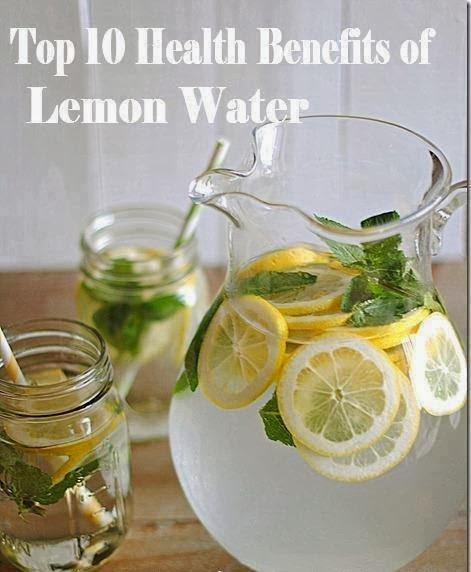 Daily consumption of lemon water can make a huge difference in the appearance of your skin. It acts as an anti-aging remedy and can remove wrinkles and blackheads. Lemon water if applied on the areas of burns can fade the scars. As lemon is a cooling agent, it reduces the burning sensation on the skin. 3. Aids in Dental Care - Lemon water is used in dental care also. If fresh lemon juice is applied on the areas of toothache, it can assist in getting rid of the pain. The massages of lemon juice on gums can stop gum bleeding. It gives relief from bad smell and other problems related to gums. 4. Cures Throat Infections Lemon is an excellent fruit that aids in fighting problems related to throat infections, sore throat and tonsillitis as it has an antibacterial property. For sore throat, dilute one-half lemon juice with one- half water and gargle frequently. 5. Good for Weight Loss - One of the major health benefits of drinking lemon water is that it paves way for losing weight faster, thus acting as a great weight loss remedy. If a person takes lemon juice mixed with lukewarm water and honey, it can reduce the body weight as well. 6. Controls High Blood Pressure Lemon water works wonders for people having heart problem, owing to its high potassium content. It controls high blood pressure, dizziness, nausea as well as provides relaxation to mind and body. It also reduces mental stress and depression. 7. Assist in curing Respiratory Disorders Lemon water assists in curing respiratory problems, along with breathing problems and revives a person suffering from asthma. 8. Good for treating Rheumatism Lemon is also a diuretic and hence lemon water can treat rheumatism and arthritis. It helps to flush out bacteria and toxins out of the body. 9. Reduces Fever Lemon water can treat a person who is suffering from cold, flu or fever. It helps to break fever by increasing perspiration. 10. Acts as a blood purifier The diseases like cholera or malaria can be treated with lemon water as it can act as a blood purifier.